It's not exactly a secret the cat is a vindictive and spiteful species that uses its soft fur and affectionate purrs to infiltrate the homes of human beings who don't realize how much they're being exploited. Furniture and human flesh seem to most frequently fall victims to the endless malevolent streaks most felines display, but if you're a cat looking for an original way to make your owner's life more difficult, you have to think outside of the box you probably love sitting in. After presumably deciding clawing the fabric off armchairs was a little too overdone, Brigit, a cat in New Zealand, decided she needed to find another way to satisfy her primal urges and began stalking her neighborhood for prey. However, Brigit wasn't dumping decapitated mice on the front steps of her home. Her preferred target? Men's underwear...and lots and lots of socks. 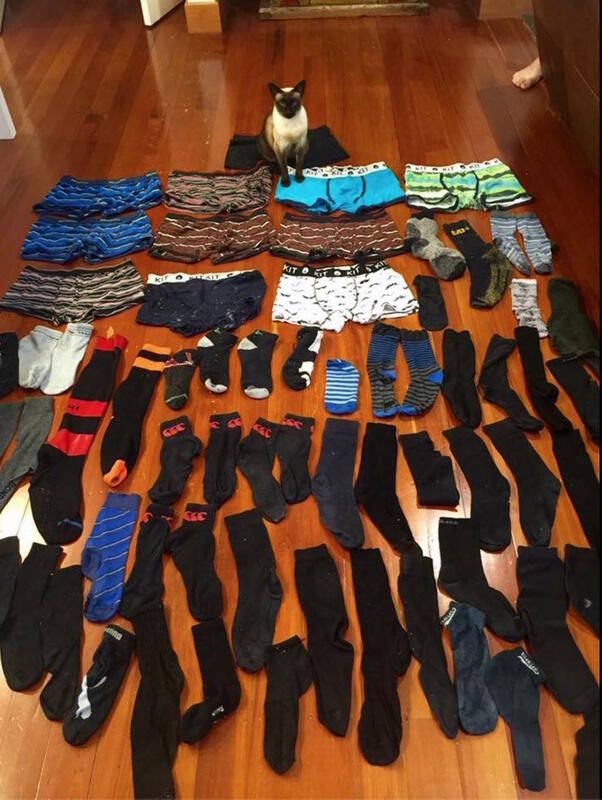 The cat's owner, Sarah Nathan, says her Tonkinese returned home with 11 pairs of underwear and 50 pairs of socks over a two-month period, and while she's not entirely sure of the origin, she has a hunch Brigit is targeting one person in particular. 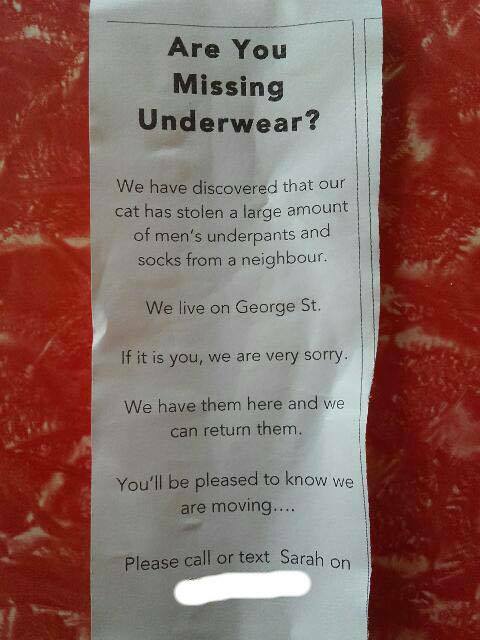 In the hopes of tracking down the person who's probably been losing his mind over the past couple of months, Nathan posted the following notice in her neighborhood. I'd say something about a cat burglar to close this out, but I'm not going to stoop to that level.